When I was growing up with this pesky illness, my mum always said to me, "Don’t let your Crohn's define you, let it run alongside you". This has remained my strong mantra throughout my life, through school, university and starting my career in journalism. What I haven’t forgotten though is that my Crohn’s has made me who I am today. And that is what anyone with IBD has to remember – especially in the darkest and lowest moments. This is why. Living with a chronic and invisible illness makes a person. You might feel like it breaks you at first. At diagnosis, when you wrap your head round these IBD buzzwords. ‘Pain’, ‘fatigue’, ‘chronic’, ‘surgery’, and ‘medication’ – it’ll feel like a seemingly endless cycle of negatives. What they don’t tell you when you get diagnosed is that this will be the making of you. It gives you strength you never knew you had. It gives you depth of emotion you never knew possible and you will feel others pain like no other. It’ll make you value what’s important and appreciate every single moment you are out living, socialising, loving and working. You’ll also understand your body like nobody else – and although this will be frustrating at times (trying to explain to a colleague/friend/doctor why you have to preserve your energy/you know the weird pain isn’t just ‘nothing’/you can’t eat the lovely cake they’ve bought you), it means you can help control your body. You can be in control!! And you will do things you never thought you would. For me this was running the British Vitality 10k in central London last month. All for Crohns & Colitis UK. I have never enjoyed sport – and when I say never, I mean I used to purposely skip PE at school because I couldn’t stand it. It has always given me excruciating stomach pain – why would I inflict that on myself?! In January I decided I needed to overcome that. I wanted to do it for everyone who has been through the same rubbish I have – and worse. Running for Crohns and Colitis UK was one of the best things I’ve ever done and made every ache and pain totally worth it. 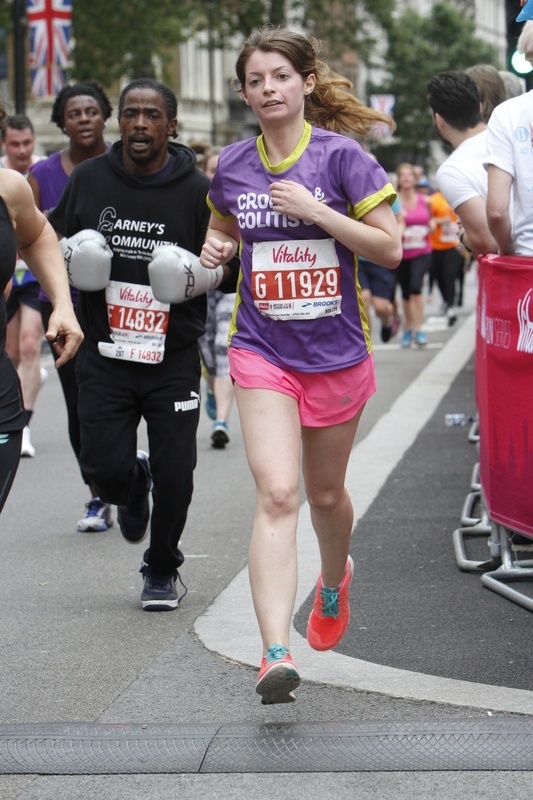 As I crossed the finishing line, I realised I never would have done anything like this without Crohns. I completed the race in 1 hour 7 mins, with £1450 money in the bank for C&C UK and I now realise I have successfully let my Crohns run alongside me. WITHOUT defining me. Which means you can do it too.